The proposed investment treaty is likely to make it easier for US companies to invest in China. 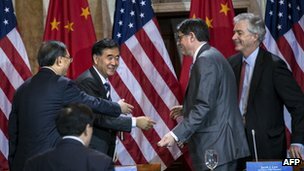 China has agreed to resume talks on a bilateral investment treaty with the US which could open up new opportunities for businesses in both countries. Chinese officials have agreed to include all sectors in the treaty, the first time Beijing has done so. The US has been pushing for such a deal as American firms have been keen to get more access to the Chinese market amid growing consumer demand there. A deal could see key sectors in China open up to investment by US firms. “A high standard US-China bilateral investment treaty is a priority for the United States and would work to level the playing field for American workers and businesses by opening markets for fair competition,” Treasury Secretary Jacob Lew said in a statement. “The commitment made today stands to be a significant breakthrough and marks the first time China has agreed to negotiate a Bilateral Investment Treaty, to include all sectors and stages of investment, with another country,” he added. The decision to restart the talks was reached at high-level negotiations between the two countries held in the US. China’s Vice Premier Wang Yang said that US had agreed to accept investment by Chinese state-owned enterprises and sovereign wealth funds. “The United States pledges to treat Chinese investment equally and fairly,” Mr Wang was quoted as saying by the Associated Press news agency. Boosted by their success back home, Chinese firms have been keen to boost their presence in the US – the world’s largest economy. However, some of the moves by Chinese companies into the US market have faced close scrutiny. Earlier this week, members of the Senate Agriculture Committee in the US expressed concerns over the China’s Shuanghui International deal to buy Virginia-based Smithfield Foods, the biggest US pork firm. Last year, a US Congressional panel warned Chinese telecom firms Huawei and ZTE pose a security threat to the US, adding that the two firms should be barred from any US mergers and acquisitions. The two firms have defended themselves and denied those claims. In September, President Barack Obama blocked a move by Chinese company, Ralls Corp, to build wind turbines in the US state of Oregon, citing national security concerns.